Take a trip to Songambele village in Kongwa District of the Republic of Tanzania, you will find a beaming farmer – Amri Simon. He has just recently harvested and sold tomatoes (harvested from his home garden plot) and made a cool revenue of TShs 450,000. This includes a good profit margin, one that Simon believes he will even better in the next coming season. But it wasn’t always like this. After several years previously growing tomatoes, the highest revenue Simon had ever made with tomatoes from his home garden plot was TShs 300,000. And even this was only when he was lucky enough to go through a planting season without his garden plots getting attacked by pests and diseases. 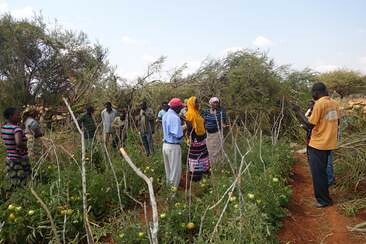 Farmers in the demonstration plots observing the new tomato variety. 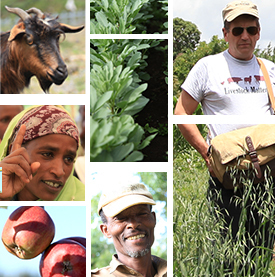 Like the name of his village Songambele which in Kiswahili literally means “moving forward”, Simon has decided to move his farming to the next level by adopting the new tomato variety Tengeru 2010 coupled with newer and better agronomic practices. Through the Africa RISING-NAFAKA-TUBORESHE CHAKULA scaling project funded by USAID, smallholder farmers in Tanzania like Simon are being empowered with new technologies such as improved tomato varieties and trainings on good agronomic practices (GAP) during nursery management, soil enhancement and pest and disease control. “I learnt a lot during the training, for example how to identify certain pests and diseases in order to address them at an early stage or how to apply the right spacing,” explains Simon. “However, the most important thing I did was the introduction of Tengeru 2010 as a new tomato variety on my farm. I am now able to harvest thirty (20 liter) buckets of tomatoes instead of just twenty buckets, which I used to get previously from the same area. Since I can sell each bucket for TShs 15,000, my revenue increased by TShs 150, 000,” he adds. Simon’s confidence in the commercial potential of the new tomato variety is buoyed by the fact that demand for Tengeru 2010 in the fresh local markets close to his village is on the rise. In fact the demand is higher than the supply at the moment. “People really like the big fruits and the slightly salty taste of this variety,” he explains. The project team has encouraged the trainees to promote this variety as it has properties which the processing-type varieties do not have. The thicker shelf and a slightly salty taste make Tengeru 2010 a preferred crop for raw consumption, for example in salads. These properties have even convinced private seed companies to start producing Tengeru 2010 seeds as a measure to respond to the demand by farmers early. 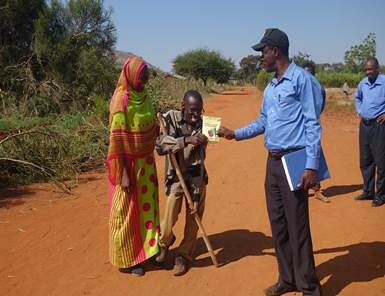 Thankfully this development will also help address the challenge of access to seeds which remains as a significant hindrance to a majority of small holder farmers in Tanzania. Tags: africa rising, AVRDC, IITA, participation, Scaling, Tanzania. Bookmark the permalink. how can I get tengeru 2010 in Zambia? I am interested in tengeru 2010.where can I get it in zambia and yield per ha with good management.also let me know npk requirement.